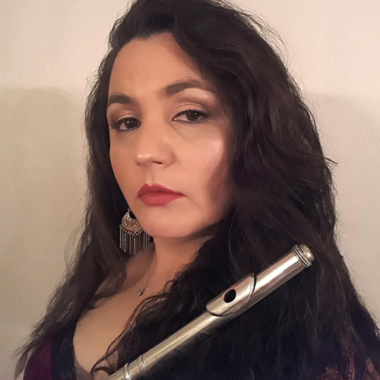 A native of the tropical country of Honduras, flautist Denissa Rivas enjoys performing in a variety of musical styles ranging from the poised and sophisticated Baroque, to the eclectic sounds of contemporary music. Denissa has performed in the United States, Latin America, and Europe, including the Edinburgh Festival Fringe in Scotland, the National Flute Conference in Las Vegas, the International Flute Festival in Honduras, and the Pittsburg Chamber Music Festival in Kansas. She has appeared as a soloist with the Southern Miss Symphony Orchestra, the San Pedro Sula Symphony Orchestra, and the Baroque Ensemble Rosso. In her repertoire, Denissa strives to include music by women composers and music from Latin America. This past July these two passions merged when she performed the premiere of composer Barbara York’s piece ‘Measuring Time’, a piece for flute, violin, and piano that fuses the urban excitement of American culture with the sensuality of Latin-American rhythms. Highlights for 2018 include solo engagements with Westwood Ensemble in Kansas City, and the Camerata Vivaldi in Tegucigalpa, Honduras; a lecture recital on women composers at the Music by Women Festival in Columbus, Mississippi; and a conference/recital on women in the arts at the Technological University of Central America (Unitec), in San Pedro Sula, Honduras. An avid chamber music performer, Denissa frequently plays with her husband, violinist Raúl Munguía, in diverse settings of that genre. They will be performing a flute and violin recital this upcoming Fall in the United States, Honduras, and Chile. Denissa currently teaches Music Theory at Pittsburg State University and maintains a private flute studio in Pittsburg, Kansas. She holds a DMA from Texas Tech University, a MM from Northwestern State University of Louisiana, a BM from the University of Southern Mississippi, and a Performance Diploma from London College of Music.